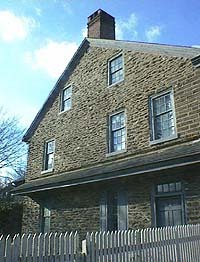 The Johnson House was in the thick of the Battle of Germantown. Later it was a stop on the Underground Railroad. So far in its life, the Johnson House has twice seen events that shaped America's history. It was built between 1765 and 1768 by Dirck Jansen who owned the ground on which Upsala was built. He built it for his son John Johnson Sr. It was one of the largest houses in Germantown. The Johnson's were Quakers, members of the Society of Friends. On account of the house, other members of the Society were concerned because of their typical disdain for large and extravagant. In 1777, the Battle of Germantown raged outside. Johnson heard the noise from the Battle and looked out his door to see what the commotion was about. An officer rode by and told him to take his family to safely. They hid in the cellar while the Battle continued. Musket shot and cannonballs struck the house. And the damage from the Battle can still be seen, today. After the Battle, victorious and hungry British soldiers stormed into the house and ate all the food in the Johnsons' kitchen. Years later, the house was used as a stop on the Underground Railroad. Through the doors of the Johnson House, slaves may have found their gateway to freedom. A historic marker stands by the entrance to the house to recall the Johnson House's significance in this regard. A historic market stands in front of the Johnson House. Built in 1768 for John Johnson. This was home to three generations of a Quaker family who worked to abolish slavery and improve living conditions for freed African Americans. In the 1850s this house was a station on the Underground Railroad. Here and in smaller buildings on the property, men and women escaping slavery found shelter in their way to freedom.